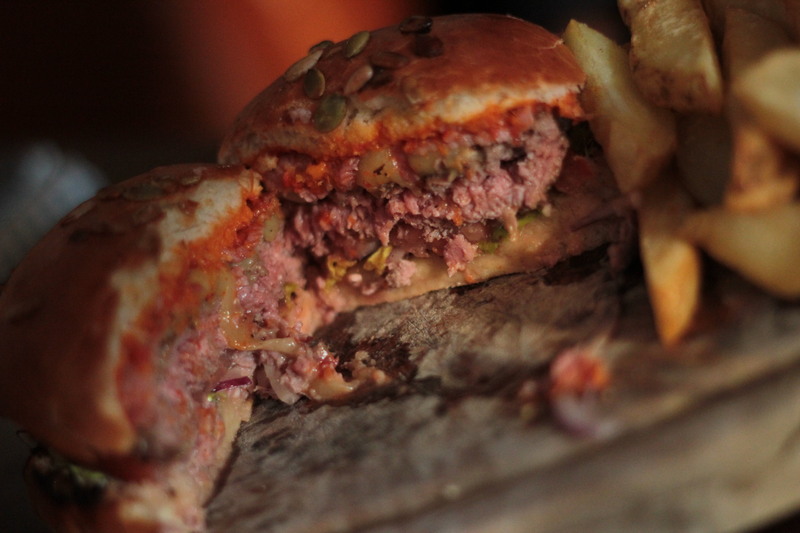 I recently sampled the Grosvenor’s oxtail and bone marrow beef burger at the 2012 Glasgow’s Best Burger contest and despite only having a few bites, I knew it was one that I had to try on it’s own. Tucked away on Ashton Lane, the Grosvenor Cafe doesn’t look all that big on the outside, but as you walk though the front door you’ll be greeted with a restaurant and bar so big, you’ll not know where to sit. We visited late afternoon as people were beginning to stop by for after-work drinks and there was a nice, bustling atmosphere and lots of lively chatter. It’s definitely somewhere I’d head back to for a night out or a couple of after work beers. Grosvenor head chef Chad Crooks has been working hard to perfect this new special burger over the last few months and everything here is made from scratch – the patty is handmade and seasoned well oxtail and bone marrow and is served on a pumpkin seed brioche bun which is made from scratch twice every day to ensure that what you are eating is as fresh as possible. I’ll start with the bun. As soon as you put your hands on it, you can tell that it’s every bit as fresh as the Grosvenor say it is and has an extremely light, airy feel to it. 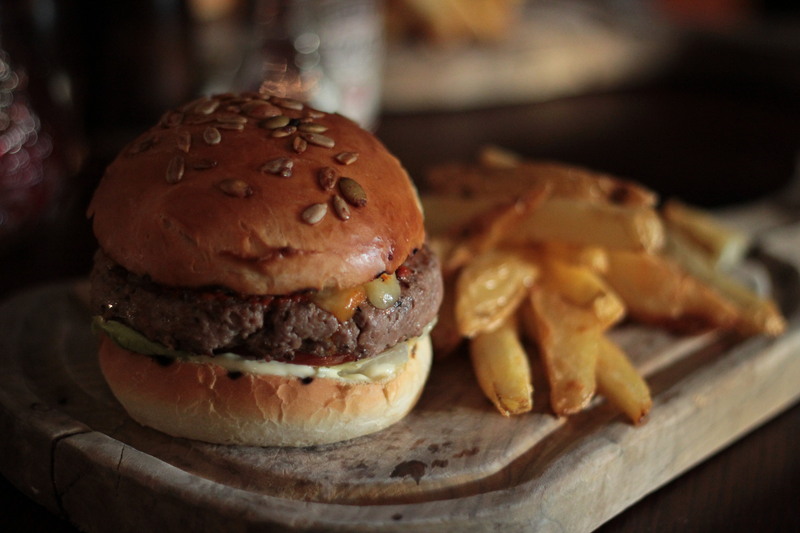 In terms of taste, the bun tastes like it has just came out of the oven – slightly warm, not overly stodgy and packed full of flavour – easily one of the best burger buns I’ve ever tasted. I’m usually a fan of sourdough over anything else, but you’d be hard pushed to find a better burger bun in Glasgow – especially one that is as fresh as this. It held the contents extremely well too and didn’t break apart at any point, even after cutting the burger in half to photograph it. So, what about the patty itself? First of all, when we ordered our food, we were asked how we wanted our burgers cooked – something that doesn’t happen a lot in Glasgow. I opted for medium rare and that is exactly what I got. The patty had an nice layer of pink in the middle and practically melted in my mouth as soon as I took a bite. Seriously, it was so tender there was almost no chewing required. Beautiful! The patty was topped with smoked cheese, mayo, lettuce and and a red pepper relish and the flavours melted together beautifully. At times, when you eat a burger you are always very aware of the various toppings – you may get a crunch of bacon and then a taste of the patty, almost as if it’s coming in layers; however, all the flavours melted into one incredibly tasty combination with this burger. The addition of the bone marrow and oxtail used to flavour the patty add a rich flavour that’ll stay with you for a while. On the drive home, I could still smell it on my hands – and it made me hungry for another burger. That’s how good this patty is. The burger was served with a portion of hand-cut fries and a side of ketchup and mayo for dipping. Head chef Chad has put a lot of time and care into crafting this burger and is very proud with the finished result – and rightfully so. 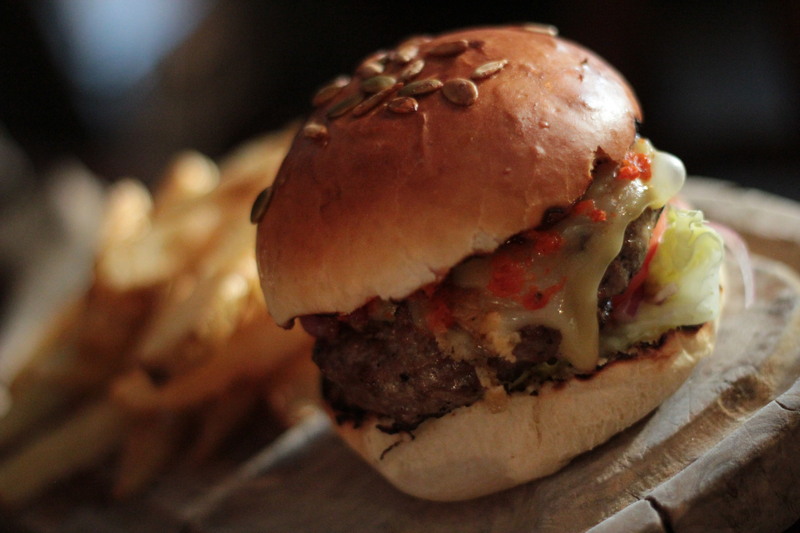 From the light, freshly baked bun to the zing of the red pepper relish combined with the intensity of the smoked cheese, right down to the beautifully seasoned patty, this burger is one not to miss! The oxtail and bone marrow burger will be offered on the Grosvensor Cafe’s specials board next weekend (September 7th-9th) at a bargain price of £8.50. Make sure you get along to Ashton Lane and try one before it’s gone! Sounds great but can’t see it on the menu!? you want to build up your muscle and drop the fat.